This is the Obituary for our Father. 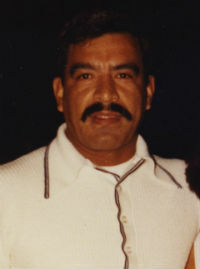 Javier Palomino Palomino, 72 years old passed away unexpectedly on 02/27/2016 in Lompoc, CA. He was born to Leon Palomino Gonzales and Maria Palomino Palomino in Guadalajara Jalisco, MX. He is Survived by his Beautiful and Loving wife of 51 years Martha Camarena Palomino, Daughter Martha/Jerry Casiano, Daughter Margaret/Rodger Mannka, Son Hector/Regina Palomino, Daughter Sandra/Duane Austin, Daughter Vivian/Mike Grant, 10 Grandchildren and 2 Great Grandchilren. His passion was being a Baker for trade, he started at the age of 19 years old working for Pan Bimbo in Guadalajara, MX for 5 years. Then migrated to Solvang, CA where he worked for 18 years at Birkholm’s Bakery to give his Family a better life. He was a hard worker and made sure his Family was always well taken care of. He and His family moved away to Gustine/Santa Nella, CA for 12 years and then moved back to Lompoc, CA to work for Vons until his retirement in 2015 to spend time and take care of his wife. He was also a big fan of the “49ers” and of the Mexican soccer team “Chivas”. Gone but not forgotten, You will always live in Our Hearts Forever. You will also be missed by lots of Family, Friends and Co-workers. Contributions can be made to the St Judes Children Research Hospital 501 St Jude Place Memphis, TN 38105. Pueblo del Rey Funeral Services.